Observation - Snow Bunting - UK and Ireland. 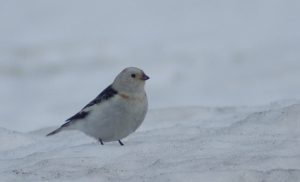 Description: Snow Bunting observed in typical mountain environment, on this occasion beside the ski runs on Cairn Gorm. Snow Bunting observed in typical mountain environment, on this occasion beside the ski runs on Cairn Gorm.